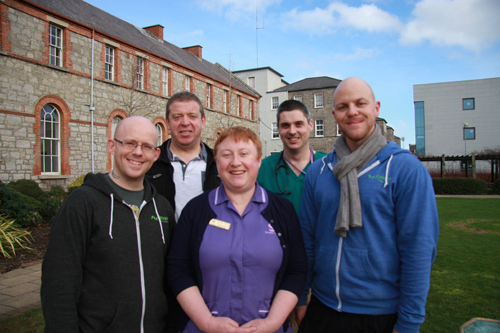 A group of fundraisers who took part in a Hell & Back event have donated more than €2,700 to the hospital’s Stroke Service. Anthony Carroll, who works at Our Lady’s Hospice in Harold’s Cross, contacted the Foundation office following the death of his brother in early 2013; his brother had been a patient at St. James’s and Anthony and his colleague Richard Murphy decided to organise a group to take part in a Hell & Back event to raise sponsorship for the hospital. They ended up with a group of thirty people who wore St. James’s Hospital t-shirts to complete their 10K obstacle course in June 2013. Their group was aided and abetted by friend and personal trainer, Andy Myers of AM Fitness. St. James’s Hospital is Ireland’s largest hospital and a major teaching hospital of Trinity College Dublin.Excellent clinical care for older patients at St. James’s Hospital is renowned and plans are now well-advanced for the development at the hospital of the Mercer’s Institute for Successful Ageing; the model centre will combine advanced services in geriatric medicine with specialist training and front-edge research.